El Angel is a small village located in the province of Carchi, in Ecuador, approximately 170 km north of Quito and situated on the border with Colombia. The village is located in a unique type of high altitude, humid moorland called “paramo” characteristically found in the Andes of northern Ecuador and southern Colombia. The El Angel Ecological Reserve lies at nearly 12,000 to 15,600 feet above sea level and covers an area of 15,700 hectares of the paramo. A diverse range of plants grow in this region, 60% of which are found nowhere else in the world. The most notable among them is frailejones (Espeletia pychnophyla) a giant member of the daisy family, endemic to the area. The frailejon is a treelike shrub with broad, gray-white, hairy leaves and yellow flowers, which may reach a height of up to six feet over the course of its lifetime. 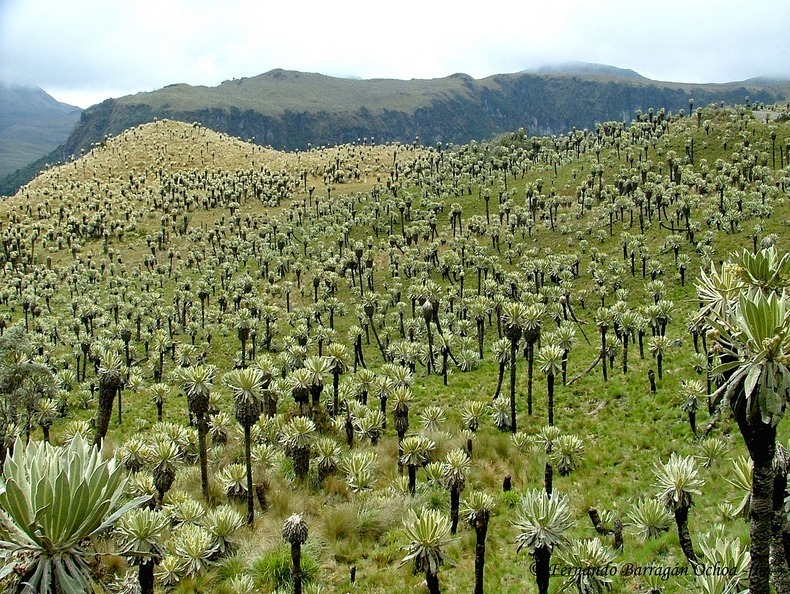 They cover 85% of the reserve, lending the paramo of El Angel its striking appearance and gray-green color.